This is the first of a series of blog posts where I will describe some of the interesting features of each of the 12 soil orders in Soil Taxonomy – the soil classification system developed for the US by the United States Department of Agriculture. Each order will be “profiled” (forgive the bad soils pun) in the order in which they are “keyed out” in Keys to Taxonomy. Gelisols, in a nutshell, are soils that are frozen. They are soils that have permafrost (frost, i.e. 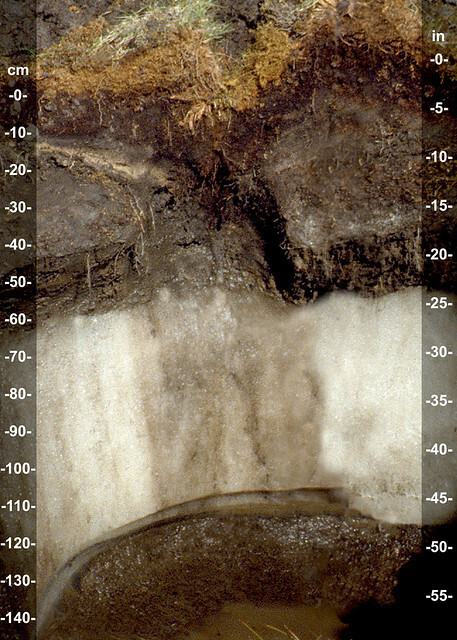 frozen soil, that is present year-round) within 100 cm of the soil surface, or have “gelic” material within 100 cm with permafrost within 200 cm of the surface. Gelic materials are mineral or organic soil that is present due to “cryoturbation”, or churning of the soil profile due to freezing and thawing. As described by Buol, et al (1997) Gelisols have three suborders including Histels, Orthels, and Turbels. [A quick note on how Taxonomy works. The formative element attributed to the soil order, in this case ‘gel’ from GELisols, always occurs at the end of the soil classification.] Histels are Gelisols that have a lot of organic matter incorporated into the soil profile. They often occur in low lying, or wet areas. Turbels (from the Latin, turbides, “disturbed”) are Gelisols that are characterized by evidence of Cryoturbation. That means that they have one or more soil horizon that is irregular, broker, or distorted due to action of freezing and thawing. Orthels (from the Greek, orthors, “true”) include all other Gelisols that do not have high amounts of organic matter, or show low evidence of churning. Gelisols can be very old soils. However they usually don’t exhibit much in terms of soil development due to short growing seasons, cold temperatures, limited plant growth, etc. 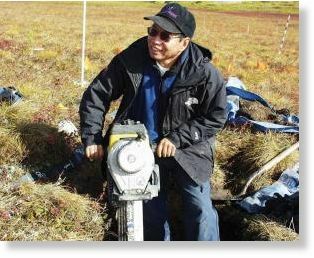 An expert in Gelisols, Chen-lu Ping, from the University of Alaska Fairbanks can be seen in the next picture using a gas-powered jack hammer to “dig” a soil profile. One thing that is interesting about Gelisols is that in some landscapes, they create a hexagonal pattern caused by the expansion of ice in cracks as shown in the following picture. Gelisols, as you can imagine, occur in areas where it is cold. For my US readers, you’ll only find them in Alaska. 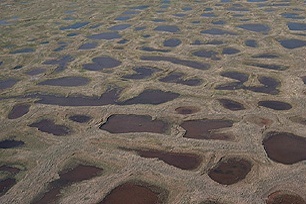 In order to use Gelisols for human uses, many precautions need to be made – mostly to ensure that the permafrost stays frozen. This would be precautions like putting buildings on stilts so that the air directly above the soil stays cold, avoiding leaving open holes in them so that they don’t thaw out from the exposed soil profile, etc. Generally they are best left wild, or used for habitat. Wildfire and human activity can cause permafrost retreat, and as Buol et al (1993) puts it, “change a nearly level terrain into a hilly thermokarst one”. This entry was posted in Lessons in Soil Science, Terminology and tagged Chen-Lu Ping, Gelisols, Histels, Orthels, Permafrost, soil, Turbels. Bookmark the permalink.